CountryPlace located in Pearland, Texas is an appealing 55+ active adult community. Planned activities, clubs and events keep residents both physically and socially active. Some activities include poker, bridge, tennis and fitness classes. The quaint welcoming environment allows residents to make strong friendships and feel safe. CountryPlace was built between 1981 and 2000 and now encompasses 841 single-family homes and townhomes. These beautiful homes offer low-maintenance living with open living space. The fun lifestyle and carefree living makes CountryPlace a great place to call home. The CountryPlace clubhouse is the hub for all social and physical activities. Most of the daily activities are held at this charming clubhouse. Residents can work out in the exercise room, enjoy a book in the library, get creative in the craft room or experience a dance, play, or special event in the multi-purpose room. Outside, residents can take a dip in the pool, play a friendly game on the tennis courts or enjoy the lake view while strolling along the paths. One of the best community features is that CountryPlace surrounds the CountryPlace Golf Course. This well-manicured 18-hole golf course accommodates all levels of play for a reasonable fee. CountryPlace is an established gated community with 841 homes including 196 townhomes. There are a wide variety of homes that suit every buyer's style, price, and needs. The low-maintenance single-family homes and townhomes feature two or three bedrooms, two bathrooms, and a garage. Most homes have beautiful views of the golf course or the lake. The townhomes are the perfect option for those who don't want to deal with the maintenance that comes with a single-family home without giving up space and functionality. CountryPlace is a very active and caring community. Planned activities include dominoes, Mah Jongg, bingo, oil painting, quilting, piano lessons, discussion groups and travel club. To stay fit residents can enjoy Jane Fonda exercise classes, yoga, tennis or water aerobics. CountryPlace is a safe and well-kept community where people make lasting friendships. CountryPlace is located in Pearland, Texas at McHard Road and Texas 288 just south of Beltway 8. Pearland boasts more than 140 restaurants that will excite your taste buds. If you re itching to shop, Pearland Town Center features two fashion department stores and other unique shops. CountryPlace is conveniently located south of Houston where you can find restaurants, shopping, museums, and more. It is close to the world famous Texas Medical Center and Hobby Airport. From the Space Center Houston to the largest Museum of Fine Arts in the Southwest, there are many attractions near CountryPlace. There are plenty of activities available in CountryPlace. Here is a sample of some of the clubs, activities and classes offered here. There are a wide variety of homes that suit every buyers style, price, and need with a total of 196 townhomes throughout CountryPlace. Most homes feature two bedrooms, two bathrooms and a garage. Floor plans are unavailable. There are over 600 single-family homes throughout CountryPlace. Most homes feature two bedrooms, two bathrooms and a two-car garage. Floor plans are unavailable. I have had the pleasure of living in both communities, having built a home in The Lakes in 2000 and then moving to Countryplace once I was old enough to "sit at the adult table". I have greatly enjoyed living in both communities. Houses were built in two phases in this place: East Side was built in phase II which started much later. The phase II ended in 2000. The last house built by US Home, the developer, finished in 2000 which was few months after my house. There was one customer-built house in the mid. 2000. I have a modern designed house in a well established senior community. It is a country living with big city convenience. Most important, it is only 12 miles to Houston Medical Center, one of the best in the US, if not the world. Country Place is a great community and it's easy on the budget too. It fits our needs perfectly and we got a beautiful home for a great price that didn't even need any updates. We wanted to stay within a smart budget so we wouldn't have to worry about paying the mortgage anymore! My husband and I have had been renting a house in Bellaire since summer 2012, in order to be close to U of H and to our church (Galleria area), and recently started our search for a home purchase. We wanted to stay close to UH and church, but cannot afford to buy in the Bellaire or Med Center area. During a visit to Country Place with an acquaintance who was scouting it out for her out-of-state 55+ friend, I was reintroduced to Country Place (on a daytrip 15 or so years ago, my husband and I stopped by to investigate this "new" 55+ community). Anyway, we now have contract on a home we previewed last Saturday, my husband turned 55 on July 2nd and, if all goes smoothly, we will be residents of Country Place on or before July 31st! The amenties of Pearland are great and only 5 mins down the road. Hwy 288 is 2.5 mins from our driveway. U of H is a 20 min drive, and our church is a little over 20 mins. 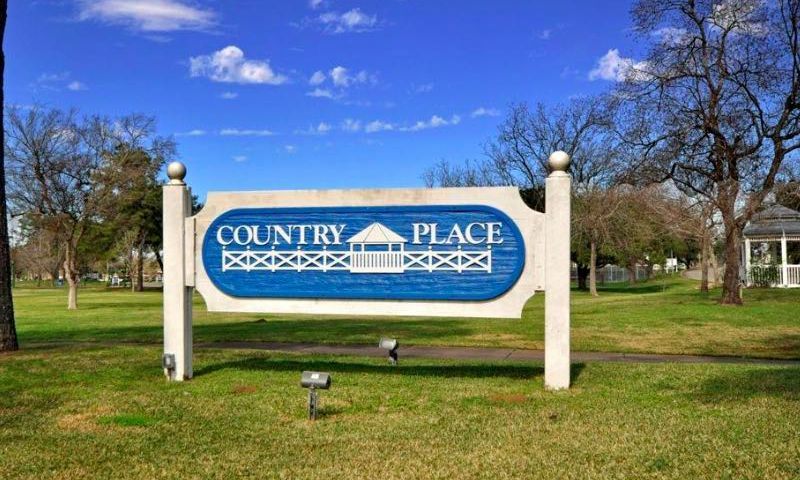 Country Place has a gym, a billiard room, a clubhouse for large social events, bingo, etc - even an actual stage for their very own theatre productions, a beautiful sparkling pool, an immaculately maintined golf course, and a strong HOA!! We are truly looking forward to the Country Place experience! 55places.com is not affiliated with the developer(s) or homeowners association of CountryPlace. The information you submit is distributed to a 55places.com Partner Agent, who is a licensed real estate agent. The information regarding CountryPlace has not been verified or approved by the developer or homeowners association. Please verify all information prior to purchasing. 55places.com is not responsible for any errors regarding the information displayed on this website.